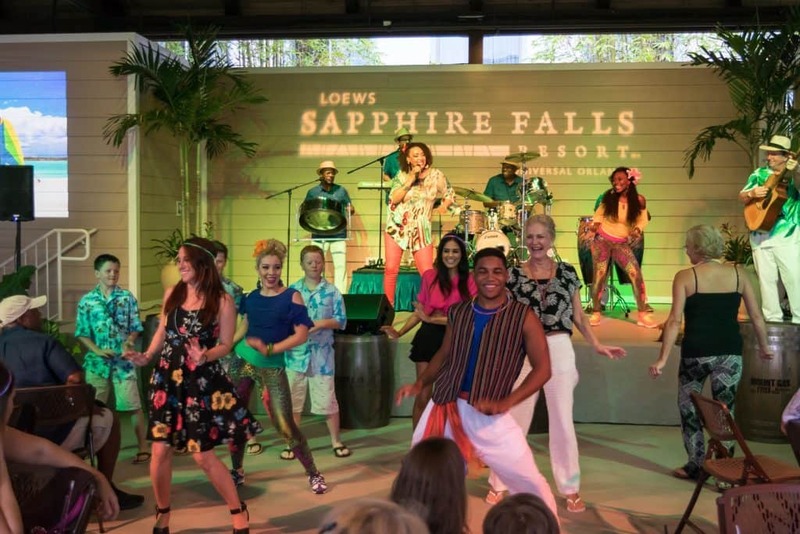 This week, I was excited to experience a flavorful journey through the Caribbean at Sapphire Falls Resort’s new weekly dinner show, Caribbean Carnaval. 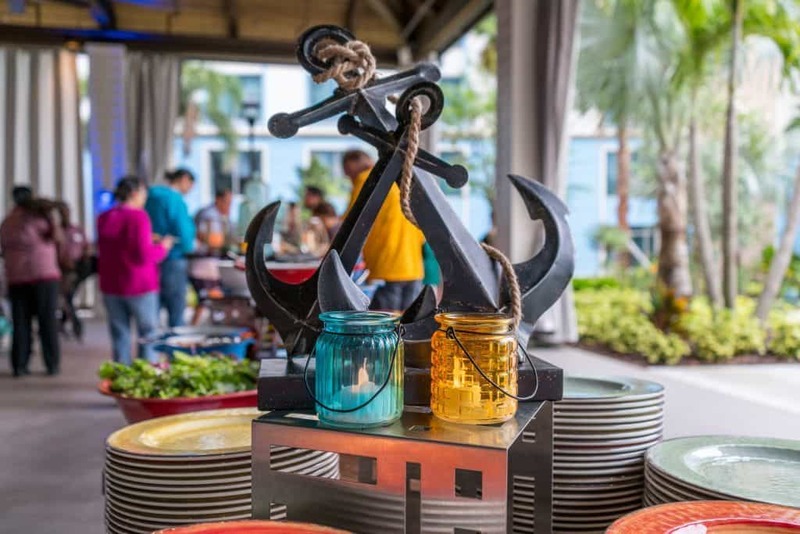 The spread included a buffet of various greens, entrees, side dishes, and desserts, along with unlimited beverages, which included the hotel’s signature Planter’s Punch. 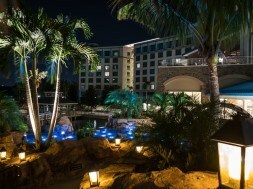 The service was great, with the buffet opening at 6:00 pm and concluding when the show started at 7:00. A bar was set up in the corner with complimentary Planter’s Punch, Bud Light, wine, and more. The wait staff was quick to clear plates as you finished them off and offer refills on water and your beverage of choice. Want a more detailed description of the evening? Here we go. For starters, they had a wonderful arrangement of greens, with all the organic fixings for a great mixed green salad, including corn bread croutons. Oven-roasted vegetables, seasonal vegetables, green bananas and yucca escabeche, and pinto bean and shrimp salad made up the remainder of the side dishes. All were very flavorful, and you could tell they were as close to fresh from the farm as you could get. The main dishes is where the buffet really shined. The Jerk Chicken and Sweet Potatoes was spicy and well cooked – it was very moist, with a nice blend of Caribbean jerk spices. Next up was the Grilled Snapper, which was served on a bed of coconut rice. This dish was flavorful, but a bit tough, comprised of hefty filets with a hint of coconut buried beneath the layers of corn and black beans. It was as succulent as chicken, with a slightly less pronounced flavor. The Ropa Vieja was a mix of shredded beef with hints of tomato and topped with sweet plantains. The beef was well marinated, but not consistently the most tender. A nice, subtle flavor was provided by the tomatoes, and the sweet plantains made for a filling treat. 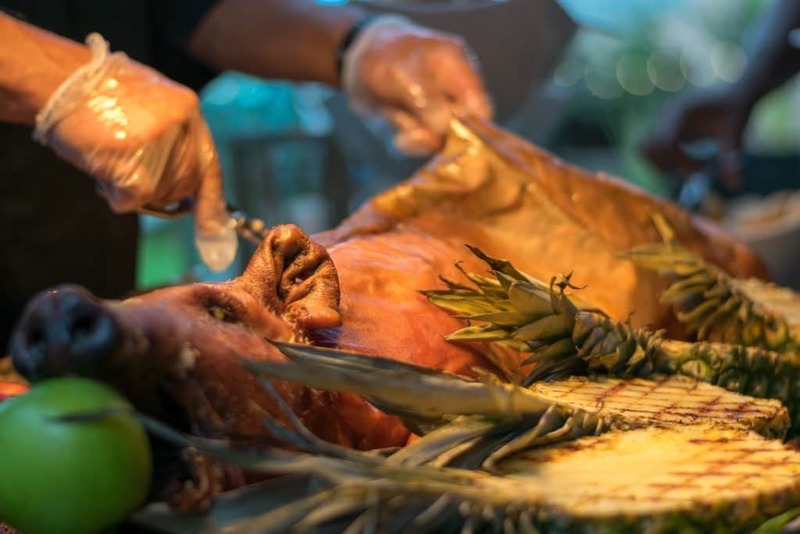 Last up was the whole Mojo Roasted Pig, set up as a carving station with a beautiful display – and a taste to match. It featured a great blend of fat and meat to satiate even the hungriest of guests. Served along with assorted rolls (including coconut-pineapple ones) and house-made barbecue and chimichurri sauces, this dish was even good plain! My favorite of the entrees was the Jerk Chicken and Sweet Potatoes, but the rest were all very close runners-up. 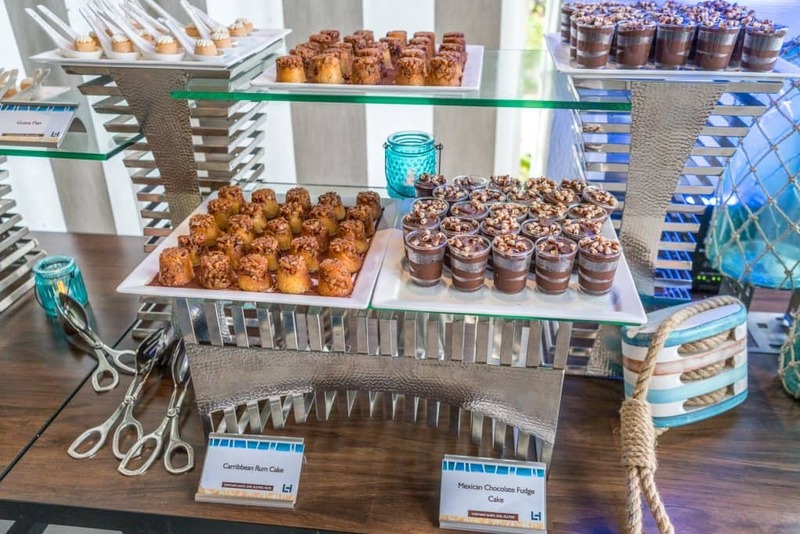 For dessert, the buffet had a secondary mini-dessert bar that included Caribbean Rum Cake, Guava Flan, Mexican Chocolate Fudge Cake, and Coconut and Caramel Rice Pudding. Our favorite was the Mexican Chocolate Fudge Cake – very sweet and moist, it melted in your mouth. For chocolate lovers, this is a must-try! The signature Planter’s Punch was excellent, as always. The Caribbean is all about rum flavor mixed with tropical fruits, and that’s exactly what this was. Comprised of Mt. Gay Eclipse Silver and Black Barrel rums, pineapple and lemon juice, simple syrup, grenadine, and a pineapple wedge on top, it wasn’t too sweet nor too tangy, but just right. This hit the spot, and servers would walk around refilling your glass throughout the evening. The entertainment of the evening was great, themed around taking a journey to the Caribbean islands with a taste of its music and cultures. 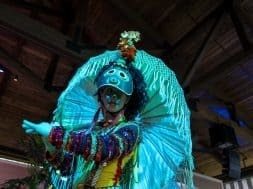 A steel-drum band greeted guests upon arrival, and entertainers placed beads and leis around guests’ necks. There was a stilt walker and roaming guitarist who improvised songs at each table based on your name or what you were celebrating while you were eating your meal. 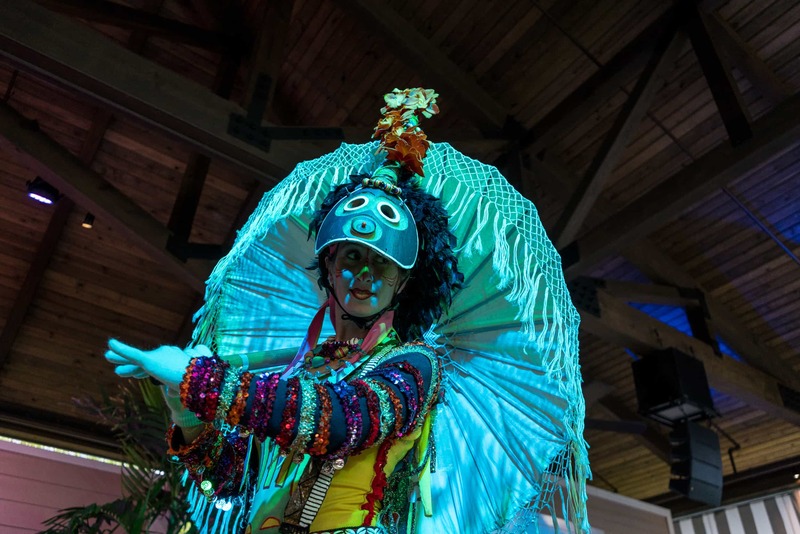 The main act of the night started at 7:00 pm, lasted nearly 50 minutes, and was full of music, dancing, and audience participation to tropical favorites, both new and old. The performers were very good, and their stage presence was astonishing. There was an opportunity for photos after the performance with the group, as well. 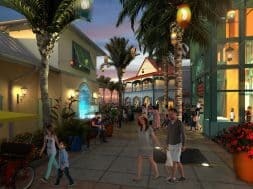 next Is Disney World’s Star Wars Land getting delayed? MikeTheFilmer Mike is an avid theme park fan who moved to Orlando 3 years ago. Annual Passholder to Universal Orlando, SeaWorld, and Disney World, Mike spends much of his free time at the parks enjoying rides, food, and live entertainment.